The Catalina 355 was awarded the Domestic Boat of the Year award in 2011 and when you step on board this beautiful cruising yacht you will see why. From the sleek lines and low profile coachroof through to the spacious and well sheltered cockpit, this boat oozes comfort, practicality and the trademark Catalina features including wide, clear sidedecks and hard wearing deck surfaces. The 2011 Catalina 355,"Nayu", has been meticulously looked after and presents in beautiful, near new looking condition, offering exceptional value for money. Sails in great condition, only 650 hours on the engine. Easy handling and sporty performance makes the 355 a stand-out cruising yacht. In mast furling mainsail, great anchor setup, functional cockpit layout with well positioned instruments makes short handed sailing a breeze. The main cabin interior presents a light an airy feel with tasteful teak cabinetry and light varnish trim. Quality upholstery provides superior comfort and stylish looks. The versatile dinette table provides plenty of seating options and additional sleeping accommodation. A roomy double V berth cabin with island bed and the huge double aft bed both have quality innerspring mattresses for home comfort. The 1.37m shallow draft wing keel provides options for more anchorages without sacrificing performance. Recently antifouled after cruising the Whitsundays, "Nayu" is ready to go, with nothing that needs doing, but to head off. Buyers late model mono hull production yachts Beneteau, Jeanneau, Bavaria should take a look at the features of the US build Catalina. 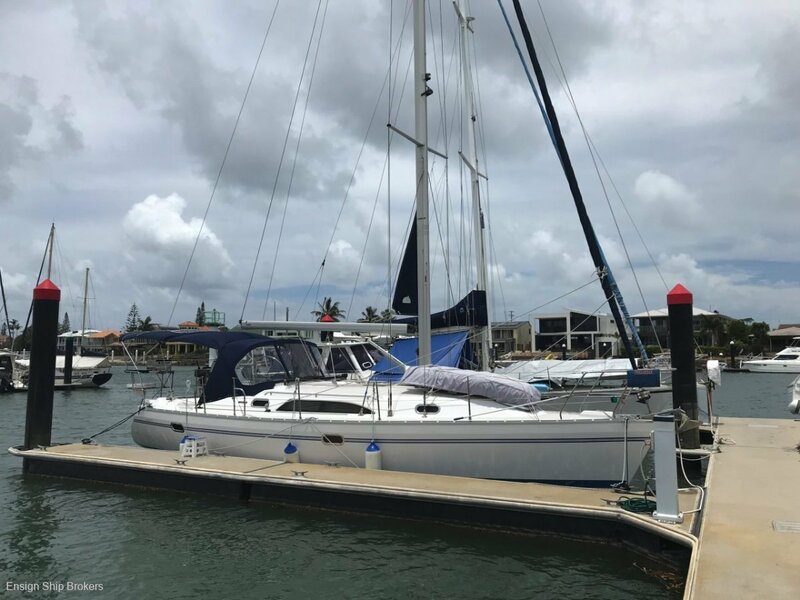 Call for an inspection of this well set up cruising yacht at Ensign Mooloolaba Marina. You will not be disappointed. Accommodation: SALOON: Very open, light saloon with large dinette + 2 seats / nav. Cabins: 2 x Cabins. Double V cabin, Double Aft cabin.